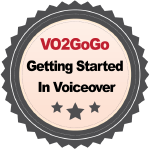 This free eClass will tell you everything you need to know to create a roadmap to a successful VO career. Led by David H. Lawrence XVII, you'll find out what tools you need, what skills you must acquire, what performance capabilities you must have, and more. Get this class free by adding it to your cart and checking out. This free class will tell you everything you need to know to create a roadmap to a successful VO career. Led by David H. Lawrence XVII, you’ll find out what tools you need, what skills you must acquire, what performance capabilities you must have, and more. Get this 10-lesson, step by step eClass free by adding it to your cart. You’ll take an interactive class that has homework, quizzes, discussion, and even a printable certificate upon completion of the class. And again, it’s absolutely free.